Since her 1999 directorial debut The Virgin Suicides, Sofia Coppola has been acclaimed by critics and audiences alike for her stylish take on modern cinema. Lyrical in her examination of both the banalities and extremities of life, despite being the daughter of one of the most famous directors of all time – Francis Ford Coppola (The Godfather, Apocalypse Now) – Sofia Coppola has established her own style and reputation as a contemporary auteur. Her latest film The Beguiled sees Coppola taking some risks with this style, stripping back what she does to its bare essentials. So as she moves into a new creative period, we thought it would be fun to take a look back at how she got here and escape into The Beguiled by looking back at Sofia Coppola’s six most stylish scenes. Coppola’s debut film The Virgin Suicides, an adaptation of Jeffrey Eugenides’ lyrical novel, announced her as one of contemporary cinema’s great stylists-to-be. Telling the tragic story of the conservative Catholic Lisbon family and their five daughters’ titular suicides, the film is characterised by a dreamy atmosphere of repressed sexuality and lost innocence, in no small part due to the amazing soundtrack by French production duo Air. One of the most stylish scenes of the film and in Coppola’s career comes following the high school prom. The emotional peak of the film, Lux (Kirsten Dunst) and school heartthrob Trip (Josh Hartnett) run away from the dance, with Trip convincing Lux to sleep with him on the football field. Waking to find herself alone, the heartbreaking tragedy of the scene is emphasised by the wistful tones of Air’s “Playground Love” and accentuated by the blue tone of the photography. Lux’s walk/ride home is thus elevated into one of the purest examples of Coppola’s talent for matching sound and vision with style. Seen by many as her masterpiece, Lost In Translation explores the relationship that forms between an ageing and fading Hollywood actor, Bob Harris (played by Bill Murray), and lonely newlywed philosophy graduate Charlotte (played by Scarlett Johansson). Kicking off with their meeting at the Tokyo Park Hyatt Hotel, the film follows these two lonely, bored, privileged people as they slowly form a unique bond, made special by Coppola’s ability to inhabit emotional ambiguity from the inside to give us a look in. This ambiguity reaches its zenith with the famous karaoke scene, where Charlotte takes Bob for a night out on the town with her husband’s Japanese friends. Performing “Brass in Pocket’ by The Pretenders, Charlotte oozes an almost paradoxical sense of innocence and seduction, looking at Bob as she sings the songs’ many innuendos. Bob then takes a turn, singing The Roxy Music classic and equally suggestive “More Than This” with the song’s lyrics: “…It was fun for a while / There was no way of knowing / Like a dream in the night / Who can say where we’re going / No care in the world / Maybe I’m learning…” brilliantly articulating the unspoken subtext of the scene. What could have been a saccharine scene is here elevated not only by Coppola’s deft direction, using the subtle movements, looks and facial expressions of her actors with masterful restraint, but also by the preceding scene’s clear, yet indirect establishing of their growing friendship and attraction. Coppola’s ability to balance subversion and reverence is at its peak in her period-meets-pop biopic of Austrian-born French monarch Marie Antoinette. In particular, Marie’s birthday scene stands out as representative of the director’s willingness to experiment and strike out in her own style. Choosing New Order’s “Ceremony” to soundtrack a scene so richly decorated and costumed in the period style, Coppola is planting her flag in the sand and announcing to the audience that this isn’t your standard stuffy period drama. Coming out of her own personal obsession with New Order and a desire for the film to have the feeling of a “New Romantic” teen drama, the scene breathes life into the characters and the history while showing us the emptiness of Marie’s life and how she will come to fill it with material pleasures. All while looking absolutely stunning, especially when she and her ladies-in-waiting run out into the garden to watch the sunrise like any good 18-year-old should on her birthday. Having been a fan of the long shot since The Virgin Suicides, for The Bling Ring (Coppola’s big-screen real-life story of a gang of privileged, upper-class high school teenagers who break into celebrities’ homes) she went all out. When the gang decides to rob Audrina Partridge’s mansion, Coppola shows us the whole thing in one uninterrupted, extreme long shot. Lasting almost two minutes, the house’s floor-to-ceiling windows allow us to watch as the young robbers move through the space, stealing whatever articles of interest they happen to find. Coppola dollies in slowly on the scene, as if responding to our own voyeuristic curiosity. The sound design emphasises this, as well as the tension and suspense, using atmospheric sound effects like crickets, dogs barking, aeroplane engines and police sirens to well and truly make it feel like we’re outside, looking in. Taken out of context (as it will be here) this scene loses a bit of its impact. But nestled in with the rest of the film’s more energetic moments and drama, the scene stands out as a daring move by a director unafraid to ruffle some feathers in the name of cinema. Ending Lost In Translation with an unheard whisper from Bob to Charlotte was always going to get people talking but I don’t think even Coppola realised just how heavily discussed and dissected this scene would become in time. Seeing Charlotte walking down a busy street while in a car on his way to the airport, Bob gets out and calls out, stopping her with tears in her eyes. Embracing each other, he whispers something to her and they kiss, and “Just Like Honey” by The Jesus & Mary Chain begins to play as they let go of each other and wave goodbye. He gets back in his car and she walks away, smiling slightly and she leaves the screen. Enigmatic and open to interpretation, the scene stands out as an early example of Coppola’s freedom as a director. Where other filmmakers working on their second feature might demure from allowing their audience such a say in deciding the outcome of the film, Coppola relishes the opportunity. 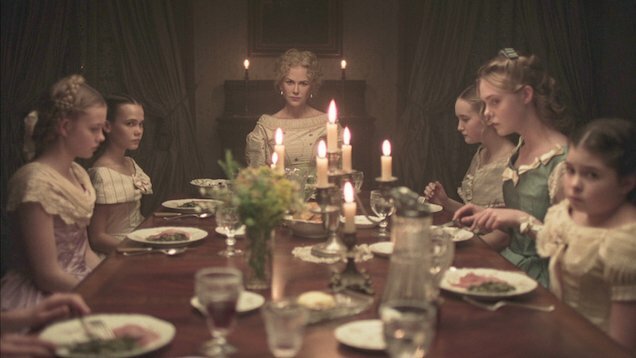 Coppola’s latest film, the Civil War-set The Beguiled, departs from a lot of the director’s trademark stylistic features. With a minimalist score by Phoenix (Coppola and frontman Thomas Mars, of course, being husband and wife) replacing her usual pop music cues and an equally dreamlike yet stark atmosphere instead of the glitz she’s known for, the film marks the director’s move into a new creative period, putting aside the favourite toys of her cinematic youth and finding new ones to play with. As such, the film is the most suspenseful of Coppola’s career so far. Telling the story of a group of teachers and students from a girls’ school in Virginia who, while hiding in the school as the Civil War rages, find wounded Union soldier John McBurney (Colin Farrell) and nurse him back to health. The presence of the soldier in a house full of women, starved of male attention, soon leads to conflict, both between the women themselves and between them and the soldier. Opening with the kind of ethereal charm one expects from Coppola, she soon upends expectations. The tension between the characters rises purposefully through the film, with the director masterfully turning up the pressure bit by bit. And when it finally breaks, all hell breaks loose. It is during this breaking loose that we get the love scene between the soldier and teacher Edwina Morrow (Kirsten Dunst). The love shared between McBurney and Morrow is not sweet and tender, but raw and passionate, blurring the line between attraction and aggression. Coppola captures the moment brilliantly, allowing the performances to shine with minimal music or directorial flair, finding an emotional maximalism in her stylistic minimalism.